Users can submit maps via the Map Gallery page at the Esri User Conference web site from early March to the end of May. Display space is reserved on a first-come, first-served basis, so users should submit their maps as early as possible to reserve a prime location. If you have questions, send an email to Ucmaps@esri.com. We are living in an exciting age for GIS and cartography. Maps are being used in new and innovative ways to solve a wide array of problems and challenges. To celebrate the ubiquitous nature of maps, Esri User Conference (Esri UC) attendees are invited each year to share their work in GIS and cartography. Hundreds of Esri users display their very best mapping efforts in the Map Gallery during the Esri UC. It's a remarkable collection of work. 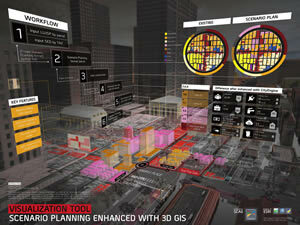 The Visualization Tool – Scenario Planning and Enhanced 3D won Best of Show and Most Unique map in the Map gallery competition. This year, nearly 700 maps were submitted for the Map Gallery and judged by Esri staff. Here's a list of the winners. The Southern California Association of Governments (SCAG) won Best of Show for the Map Gallery for its Visualization Tool – Scenario Planning and Enhanced 3D GIS. This articulate and information-rich map of a city planning scenario renders an eye-catching urban area with clear thematic cartography in three dimensions, within a thoughtfully muted city texture for context and balance. All elements, whether they are before/after map comparisons, business graphics, or annotated workflow stages, are integrated directly within the three-dimensional perspective while maintaining a balanced composition. Aesthetic choices, such as a semi-futuristic font, faint but crisp reference callouts, and color palette, are perfectly suited to the overall nature of the topic and an effective driver of a tone that implies precision, urgency, and intelligence. SCAG also won the award for Most Unique map for the same visualization tool. Rather than place supporting information around the edges of the map, important features, call-outs, and infographics were placed directly into the 3D scene itself. This map is a great example of how 3D presentations can truly enhance the map reading experience. The poster Identifying Potential Cave/Karst Features Using LiDAR impressed the judges, winning the award for Best Instructional Map. Jefferson County Open Space won Best Map Series or Atlas for its Jeffco Outdoor Regional Map Series. The box set of recreational maps shows trails, historic sites, parks, parking options, and activities for Jefferson County, Colorado. The strong, clear graphic design of the maps pull readers in and provides a great overall user experience with many thoughtful design touches. After seeing these maps, you will want to visit and explore this beautiful area west of the city of Denver. The United States Department of Agriculture (USDA) Forest Service won Best Instructional Map for the poster Identifying Potential Cave/Karst Features Using LiDAR. The judges liked the do-it-yourself nature of this poster to help cave enthusiasts find new features in (and below) landscapes, and how it invited them to use advanced GIS and Lidar technology to study cave and karst features such as sinkholes, springs, and vertical shafts. 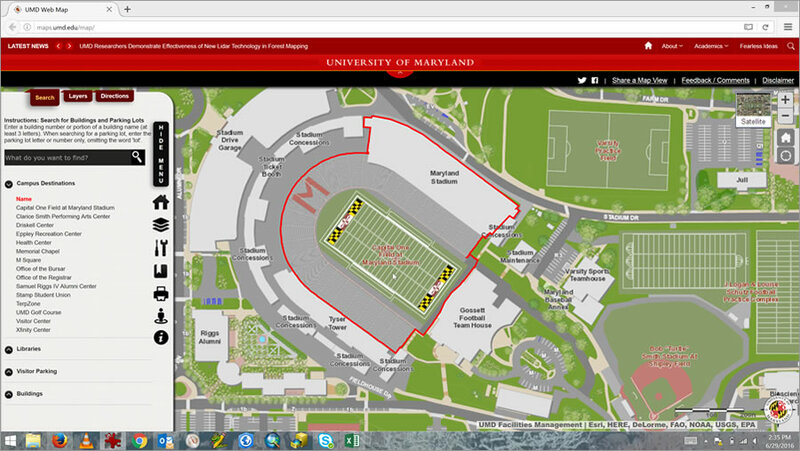 The University of Maryland Interactive Campus Map contained a lot of useful information for students, staff, and faculty. The University of Maryland Interactive Campus Map by the University of Maryland won the award for Using an API in a Map because of this map's ability to leverage many of the powerful capabilities of the ArcGIS platform through the API. This map has a clean interface and contains a wealth of information about the campus on-demand via pop ups. This year's fantastic collection of student map entries left a strong impression on the judges. These maps did more than simply plot data. They used analysis to generate understanding, explored the power of the ArcGIS platform, and communicated insights clearly and convincingly. Samantha Hmelovsky, a student at Sunrise Drive Elementary in Sayville, New York, won in the Student Map Under Age 13 category for her poster on The Effect of Dissolved Oxygen and Nitrate Levels on Organisms in the Carmans River. The river is in Long Island, New York. Caitlin Gormley from Sayville High School in West Sayville, New York, won Best Student Map Age 13-18 for her map Geospatial Analysis of Hydrofracturing Activities Related to Human Health Outcomes in the Marcellus Shale Region. Michael Clementz from the University of Minnesota won Best Student Map Postgrad for his Air Operations Planning Map Series, an aeronautical planning map series showing portions of Antarctica. The United States Environmental Protection Agency (EPA) won Best Story Map for Ten Things to Know About EPA's Clean Power Plan. This Story Map Journal makes good use of fonts and colors in the side panel. Links in the text drive the appearance of the map, drawing readers in further. This map from the Nature Conservancy was lauded for an "exquisite cartographic design." 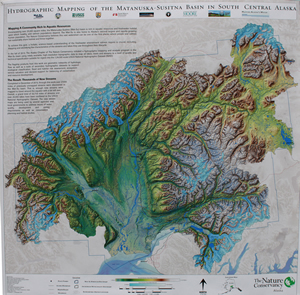 The Nature Conservancy won Best Large Format printed map for Hydrographic Mapping of the Matanuska-Susitna Basin in South Central Alaska. The map made great use of a number of cutting edge data products including the new United States Geological Survey (USGS) national hydrographic database, airborne lidar data, and nautical charts. The exquisite cartographic design emphasized beautiful 3D terrain and mapped many miles of previously unmapped streams. The perennial challenge for mapmakers that vie for Best Small Format printed map is always how to make maximum use of limited space and condense large amounts of data into a clear, concise map portrait. The Vermont Agency of Transportation won for Saratoga Spa State Park- Cross Country Ski Trails for its good color balance, easy to read content, legible labels, and intuitive symbols. The USGS won Best ArcGIS Pro Map for its map, Geologic map of the Alamosa 30 by 60 minute quadrangle, south-central Colorado. Packed with an astonishing amount of very fine detailed information about the rock types, faults, and geologic ages, this map pushes the envelope of ArcGIS Pro in both the printed and interactive environments. Florida Atlantic University won Best Analytic Presentation for its poster, Correcting Imagery for Accurate Surface Water Salinity Models using GIS and Remote Sensing. The mapmakers showed a novel process for greater accuracy in analysis, in a well formatted layout, with a resulting model that can be used in future analysis for real world needs. Doug Cain received an award from the Cartography Special Interest Group (CartoSIG) for his map of a 14th century working canal that runs across the border of Wales and England. The Tracy Arms-Ford Terror and Chuck River Wilderness Map created by the USDA Forest Service. This is a well-designed reference map, with excellent balance, subtle contour lines and glacier contours, and great integration of text and map. Narrowboat on the Llangollen Canal by Doug Cain, which portrays a 14th century working canal. With a long a narrow layout, like the canal itself, this map is clear and readable as a good reference map ought to be, making it easy to locate oneself in the landscape. The Arctic: A GEOINT Perspective by the National Geospatial-Intelligence Agency (NGA) is a relatively small map, tidy and well-balanced, with great use of the polar projections to tell a story of change over time. Predicting how future changes to this region will affect geopolitical interests is important and interesting. The Republic of Turkey's General Directorate of Highways won the People's Choice Award for its poster, GIS Based Investment Management Systems. The poster shows how ModelBuilder is used to monitor and predict needs of the national highway system. ModelBuilder is a visual programming language for building geoprocessing workflows that is available in Esri ArcGIS for Desktop's ArcMap and ArcGIS Pro. This winner is voted on by conference goers themselves and is always a nice achievement for any author. Members of the International Cartographic Association (ICA) and International Map Industry Association (IMIA) also evaluated the Map Gallery submissions this year. The purpose of the ICA and IMIA at UC Award is to promote and recognize excellence in map design and advancement in cartography. This portion of the competition was open to all mapmakers with registered entries in any category within the Map Gallery. Noted cartographers, who have shared their work in the ICA and/or IMIA, judged the entries. This map was designed to highlight areas of the world where children are very vulnerable to risks caused by climate change, including severe flooding. 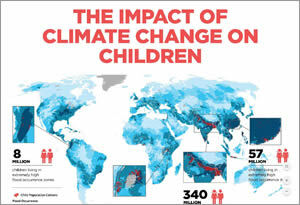 Impact of Climate Change on Children by UNICEF was recognized by the judges for its powerful, stark design on a relevant, topical subject. This work delivered a high impact, strong message with clarity and effective simplicity. Surficial Geology of Morris County, Kansas created by Kansas Geological Survey showed good connectivity between the elements of the map entry with a strong use of color and excellent composition. The richly detailed map was enhanced by the geologic cross section diagrams and the details-on-demand nature of the layout. The User Application Fair at the Esri UC offers the opportunity to recognize the latest, emerging GIS technology. This year's award went to the Unidad de Planificación Rural Agropecuaria (UPRA) for its Script for Grouping Polygons through Accumulated Magnitudes. The GeoNet MVPs are the most active members of Esri's GeoNet community in the past year. These awards recognize the most active members of this online group who bring an energy and spirit that makes the community a better place for the rest of us. Robert Scheitlin won first place, Dan Patterson took second place, and Rebecca Strauch won third place.